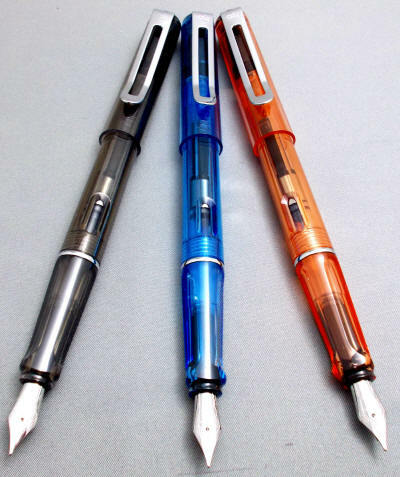 "Dear Norman: Thank you again for the wonderful fountain pens and your personal service. You are as much a purveyor of magic wands and the owner/.proprietor to the Magic Wand Shop in Harry Potter's Dagon Alley. As you are well aware, there is a larger investment of time, thought and care when using a fountain pen to write anything. The writing becomes more personal and special. Having the fountain pen in my hand and thinking about the enjoyment it brings inspired me to write the following few lines. Please feel free to use all or any part of it on your Web site. Everyone should know that a fountain pen is the magical instrument that translates thoughts from the head to the hand by way of the heart. Sort of like a wizard's or sorceress' wand. As every muggle ought to know, it is not the wand that has magical powers. The wand is the conduit that channels the magical, creative force within a person and makes it real and visible. Thank you Norman for your help in making people realize, and exercise, the magical being within themselves. Best Regards,"
"By the way, I got my Jinhao Ebony Jewel ‘collection’ just before my trip to Denver in the fall – I wanted a good pen that wasn’t so expensive that I had to worry about it (TSA and all)…and was not disappointed. I received more than a few inquisitive looks when taking notes at various conference sessions. I now understand the allure of the Lamy Safari. 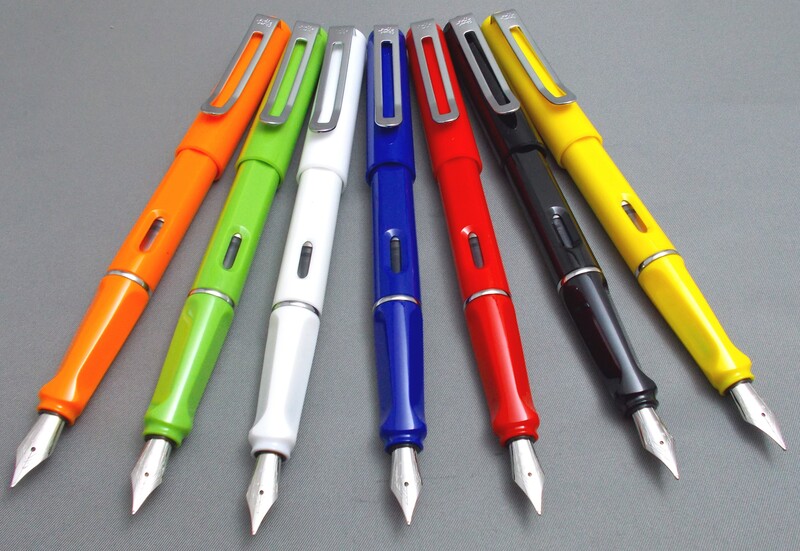 These are some of the smoothest writing pens I’ve owned (and I have a few…) As always, thanks for the excellent products and service." The ebony 'jewel' refers to the glossy black insert on the cap of each pen, no matter the color of the the barrel and cap. The model is available in both solid colors with and ink-view window, and colored translucent demonstrators as well. 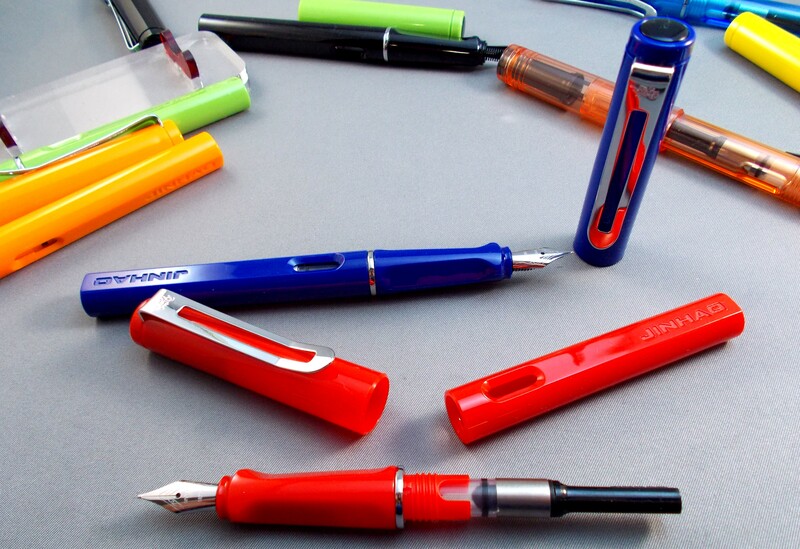 Although much of the design is based on the Lamy Safari -- at about 1/3 of the cost! -- it clearly differentiates itself by both the clip design and the large engraving of 'Jinhao' on the barrel -- as well as the ebony jewel. 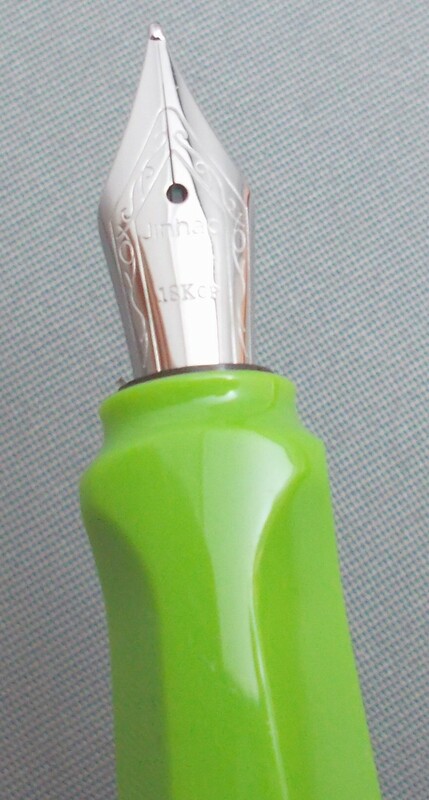 This is a full-sized pen, measuring 5-1/2" capped, 6-1/2" posted and 5-1/8" with cap held aside. 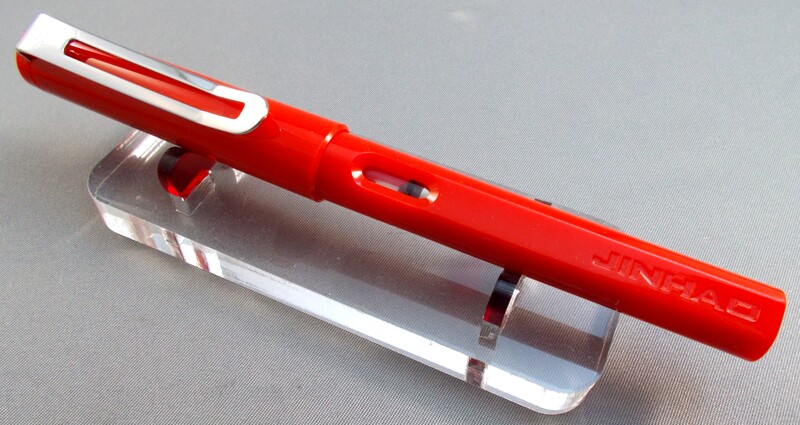 Of plastic construction, this is a great 'knock-around' pen and a perfect introductory fountain pen for an adult or a teenager (it's a bit large for a child). Because of its consequent light weight, the pen is equally comfortable and balanced when posted or with cap held aside. 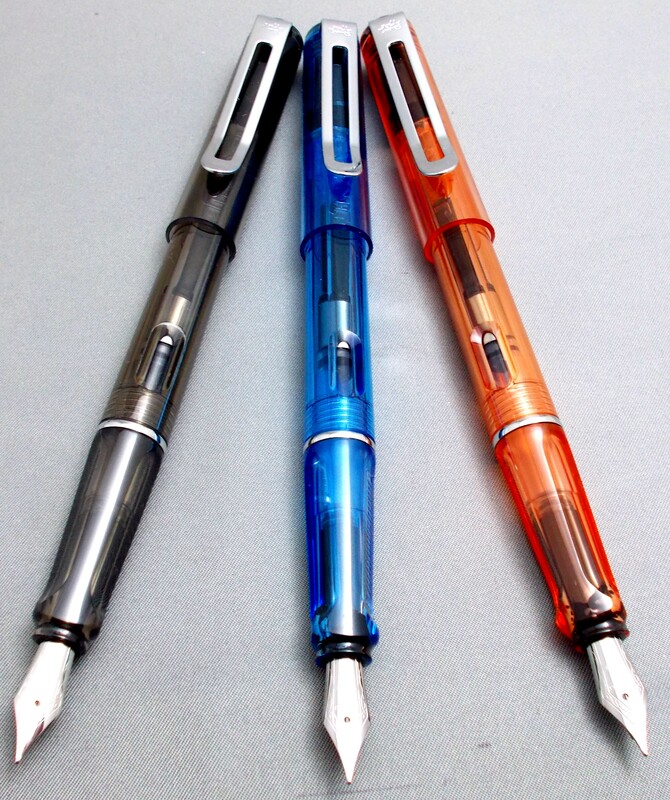 Finding a color you like shouldn't be much of a problem -- as their are seven solid and three translucent demonstrators available for you to choose from (I won't stop you from purchasing a complete color set). 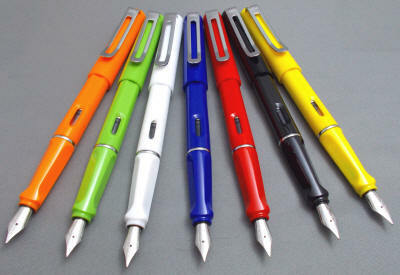 The clip is also reminiscent of the Safari shape when viewed from the side, but looked at face-on Jinhao has replaced the 'paperclip' look of the Lamy pen with a flattened -- and to my taste, more attractive -- version. 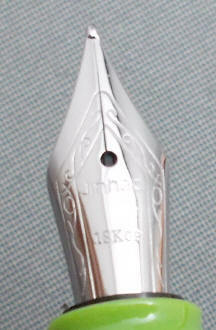 The Jinhao 'chariot' logo is subtly engraved near the top of the clip. 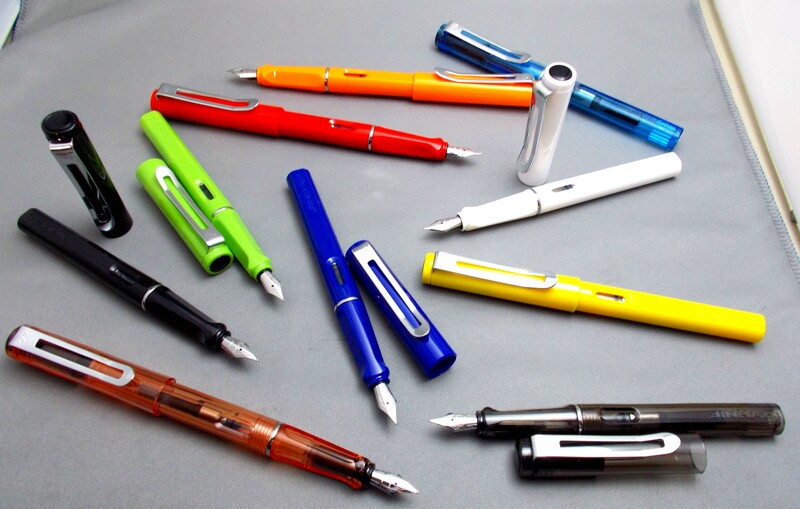 The barrel of both the solid and demonstrator versions has an ink-view window on opposite sides (not really needed for the demonstrator) which tells you at a glance when you're getting low of ink and need to refill your pen. The barrel also boldly states 'Jinhao'. Removing the slip cap -- which reseats with a secure 'click' -- presents you with the steel spear-shaped nib, which I judge to be a light-medium, meaning it falls between a typical western fine and medium. The nib says 'Jinhao' and 18KGP (for 18 karat gold-plate). Every nib I've used has been very smooth with good flow -- but of course as with all pens that leave the His Nibs' Palace, they are carefully examined and the nibs are adjusted if needed prior to shipping. The otherwise rounded and tapered section has two cutouts where one's thumb and index finger rest, which provides for a very comfortable and secure writing experience.